CEO Richard Royle described St Stephen’s digital hospital as a clinical transformation piece “not an IT installation” when he welcomed HISA members and visitors on a tour this month. It was important to treat the hospital redevelopment project as a change management piece with clinical engagement all the way through. Patient safety had to come first, he said. He said the construction was a major collaborative effort and doctors were involved in close and detailed design elements. “We ensured 80 per cent of the development would be able to be used at any UnitingCare Health facility and 20 per cent could be facility-specific”, Richard said. HISA visitors to the Hervey Bay full integrated digital hospital were taken on a tour for a look at theatre innovations as well as new patient rooms with state-of-the-art communication systems, nurses’ Workstations On Wheels and electronic records tracking all patient care from admittance to meds. 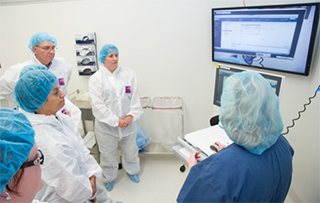 St Stephen’s Hospital is the first in Australia to achieve a HIMSS Stage 6 certification. 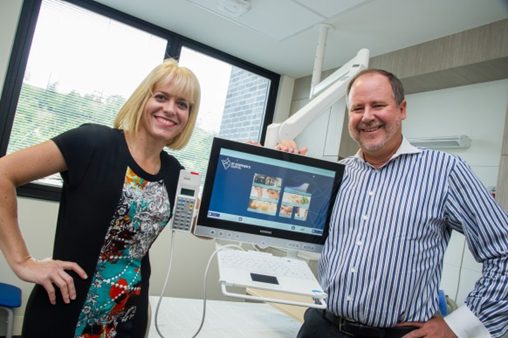 Hervey Bay tour: UnitingCare Health Executive Director Richard Royle demonstrates new patient communications for HISA CEO Dr Louise Schaper.